Letter to Johnna; WOW! is the word that hits it for me. Your care and love toward me and my family is amazing. The growth that we experienced since working with you has been life changing. It is almost difficult to put into words. ”but “amazing” is one that comes to me. Seriously. Not sure how all of it works, but you seem very confident and are multidimensional in your approach. It seemed like a session with a life coach, family consoler, spiritual guide and healer. I am not sure where we would be with out your help and guidance. Forrest, who was experiencing a lot of angst, uncontrolled energy, and irregular sleep patterns has completely turned around. Thank you! This work is extraordinarily transformational. 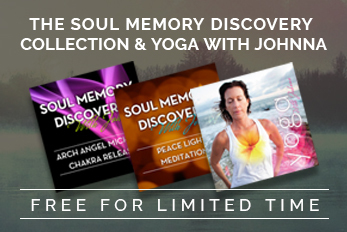 After years of struggle to find my life purpose, it was within six weeks and two sessions working with Johnna through the Soul Memory Discovery the vail had lifted. This beautiful process strengthens connection spirit, instills clarity, and restores harmony. Johnna is a gifted healer with a compassionate heart. Johnna is a blessing in my life. She has helped me clear blocks with family, work and life issues that I was unable to navigate or figure out on my own. 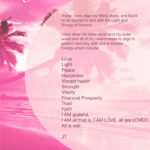 When I feel stuck I contact Johnna and instantly feel empowered and clear. I am constantly referring Johnna to friends who have experience the same benefits. Johnna was recommended to me by a close friend who had met Johnna at a conference in CA. I was seeking out “someone” who could help my daughter (10 years old at the time). She was experiencing severe “night terrors”, including leaping out of bed, crouching in corners in near hysterical states. It was extremely difficult to “wake” her, settle her down and get her back to bed. She would have no recollection of the events in the morning, but I most certainly did !! I contacted Johnna, who was immediately empathetic to my concerns and quickly scheduled time to conduct an assessment. As it turns out, my daughter was a “window” and had many earthbound spirits attached as well as other negative energies. My house also had negative energy associated within it. Johnna “cleared” my daughter and my house. The change was remarkable !! My daughter continues to be an active dreamer and talks in her sleep, but the terrors are 99.9% resolved. There has been 2 instances over the past year where I questioned if there was a slight escalation in her sleeping patterns, nothing compared to previously. I called Johnna who checked in and did the slight re balancing that was needed. My experience with Johnna has been extremely positive. She is unquestionably….a gifted healer. That healing ability integrated with her level of empathy, compassion, understanding and support has resulted in an improvement in my daughters and my daily well-being. When I met Johnna I had been experiencing life for a very LONG time like this: The feeling that life was "heavy", I felt weighted down, suffocated, and restricted although I had been putting in all kinds of effort with personal development, spiritual work etc to move past the past and those feelings....nothing I did worked...my efforts accumulated over 10 years and yet I felt the SAME...I didn't like living with this "life was SO exhausting" feeling. I wanted off the "insanity" wheel of doing the same things over and over again expecting a different result. After my sessions with Johnna I instantly felt a relief, and felt "in my body" in stead of the feeling of just lugging it around. The most important thing I learned is my Divine Design which made sense...I could see I had succumb to other people's energies (my feeling heavy) and actually was carrying their stuff around. I now can catch myself daily if I'm operating in activities that really serve WHO I AM. She did what she told me she would do as well...support me THROUGH my changes as the weeks after our sessions continued to have old stuff pop up. I didn't feel left in the lurch, instead supported as she said she would. I honor those who operate from integrity and that is why I would recommend her. Thank you Johnna! My experience with Johnna has been nothing short of life changing and the interesting part is I wasn't even seeking her when I met her. I met Johnna in 2011 as she came into my place of employment. As I was interacting with her I asked her, like I ask most of my clients about her life. She told me of something she had just started specializing in called Soul Memory Discovery and suggested I research it a bit. That night I went home I read as much as I could find on the internet. I am a pretty big skeptic however reading how it helps with anxiety, improves sleep, have clarity, increase you abundance and so forth I was definitely intrigued. I was never interested in therapy and I was probably the ideal candidate for it. I was in a job i hated, drank every day, falling into debt, dating a guy who was in and out of jail and always cheating on me and generally just in bad shape inside and out. After going back and forth with the idea I said fine what do I have to lose. To keep a long story short I must say it truly did, change my life! I opted for the one on one treatments and I did a total of three. (I felt very heavy) The sessions aren't anything you have probably experienced before, but Johnna makes you feel comfortable right from the beginning, Three of my friends saw my complete transformation and have had their own SMD sessions with similar results. Life is always a work in progress, but after a clearing change not only seems possible, but it almost seems effortless compared to the drama I dealt with before. Everyone has different dreams, wishes and hopes and SMD can definitely light the way to your new life and new self!